The word ‘refined’ is a compliment when it comes to your sense of style, but for your diet it’s another thing entirely. Here’s everything you need to know about whole foods, especially why wholegrains are super good for you. As the name suggests, whole grains contain the ‘whole’ grain, including the nutrient-rich germ, the energy-providing endosperm and the fibre-rich bran layer. Coming in different shapes and sizes, whole grains are an excellent source of healthy carbohydrates, dietary fibre and protein. They are also packed with vitamins and minerals and contain many protective components, such as antioxidants and phytonutrients (plant nutrients). Refined grains, on the other hand, have been processed, which removes the bran and germ. The refinement process gives these foods a finer texture and also removes important nutrients, such as B vitamins and fibre. Research published in the American Journal of Dieteticsrandomly assigned 144 obese people into two groups. Over the 12-week study period all participants received the same dietary advice on weight loss and were encouraged to participate in daily physical activity at a moderate intensity. One group was instructed to eat an oat-based wholegrain cereal for breakfast, while the other group ate refined cereal, with equal amounts of calories. What did they find?Results from the study showed that weight loss in the abdominal region was greater in the whole grain group. Participants in the whole grain group also lowered their cholesterol levels due to the beta gluten (a type of soluble fibre) found in oats, proven to have many health benefits including lowering LDL (bad) cholesterol and controlling blood sugar levels. “Due to the high fibre content, a single serving of whole grains will fill you up quicker and stay in your stomach longer compared to low-fibre foods,” says Fernwood’s consulting dietitian Kylie Andrew.“Refined grains like white rice and those used to make white bread and sugary breakfast cereals have had most of their fibre and nutrients stripped away, causing a huge spike in insulin levels. High insulin levels tell our bodies that plenty of energy is readily available and that it should stop burning fat and start storing it.” Adds Kylie. How much do I need to eat each day? 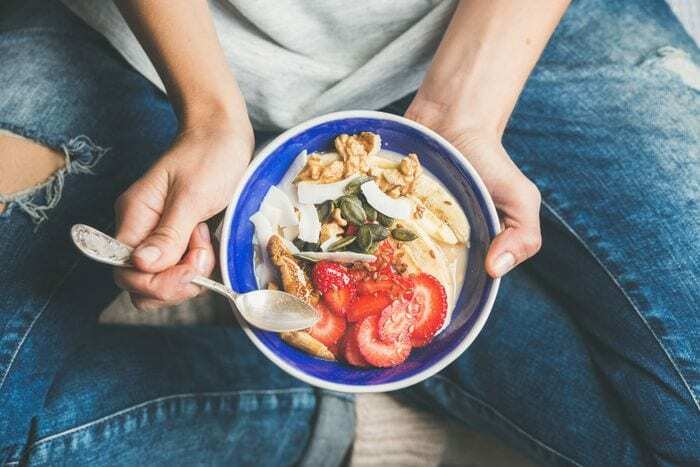 According to the Grains and Legumes Council, a good habit is to make at least half your grain (cereal) food choices wholegrains, otherwise it is recommended to eat 2- 3 serves (about 48 grams) of whole grains per day. “The fibre in whole grains, fruit, vegetables and legumes cleanses and keeps your digestive tract in good working order, helps prevent constipation and maintains regularity (keeps the bowels moving),” explains Sydney-based gastroenterologist Professor Bolin and President of the Gut Foundation. What about those embarrassing gas moments? “Adding too much fibre, too quickly can cause bloating, intestinal gas (flatulence) and other digestive discomforts,” says Bolin. Instead, Bolin recommends gradually introducing fruits, vegetables, and whole grains by starting off eating one or two fruits and vegetables a day for a week, then up your fibre intake to five servings of fruits and vegetables a day over the next week or so. Drinking at least eight glasses of water a day helps too, advises Bolin. Reaching your wholegrain daily target may be easier than you think! Combine your grains with an assortment of fruits, vegetables and a protein (lean meats, nuts, or beans), and you’ll have tasty and nutritious meals in no time. * This meal solution, when included as part of a varied and balanced diet, will help you reach 48 grams per day. Scan the bread aisle and virtually every package touts some kind of nutritional whole grain goodness. But sorting out the healthy from the merely can be tricky. It’s important to take a closer look at the food labels as you may find there’s not a single whole grain in sight. When in doubt, look for the word “whole” in the ingredients list and choose items with at least 3 grams of dietary fibre per serving. Protect against heart disease, cholesterol and lower the risk of bowel cancer. Replace white bread and rice with wholegrain varieties. Journal of Cereal Science (2007) Whole grain phytochemicals and health. Rui Hai Liu. ?